Learn a little about skunks and have some fun with our safe, smell-free activities for kids! I had difficulty finding a photo of a skunk to share here. Can you guess why? Skunks aren't the world's most popular creatures, and most photographers stay clear for good reason! Skunks are well known for spraying their enemies with a horrible smell when threatened! 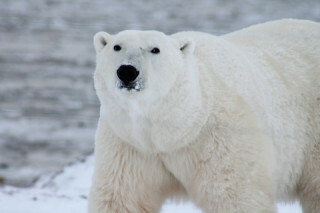 They live in the United States in woodland areas, but sometimes live near to towns and cities. Skunks are a nocturnal animal and look for their food at night. 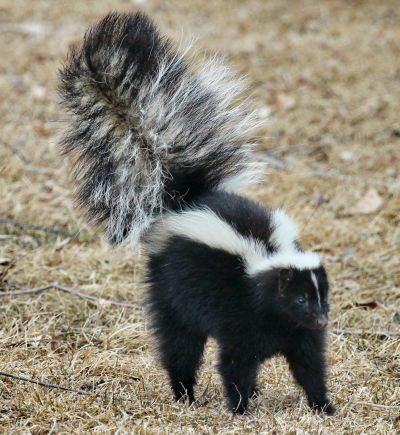 Fun Fact: Skunks can spray their stinky smell as far as 12 feet! This funny skunk has some bits missing! Can the kids complete his picture using drawing and observation skills? A skunk you draw yourself has a big advantage over a real skunk - no bad smells. Have fun learning to draw a cratoon skunk with our simple printable tutorial. Skunk isn't the easiest of words to make an acrostic poem from, so maybe start by brainstorming words beginning with the letters S, K, U, and N? This printable also makes a lovely frame for presenting writing and drawing work. Did you know that skunks are a nocturnal animal, so they sleep during the day and look for food at night? You can print out this picture of a skunk and colour it in. Here's a finger tracing worksheet aimed at younger children, featuring a very happy skunk! Ask the kids to trace the letters with their finger and colour in the picture. Copy our picture of a skunk by using the grid, one square at a time. This is a great activity for building concentration and drawing skills. Practise writing the word skunk! This lovely worksheet will encourage children to learn to form the letters correctly and then have a go on their own on the last line. Did you know there are ten different kinds of skunks? Our picture is of the familiar striped skunk and will make a fun jigsaw! Print and cut out the jigsaw and you're ready to play. Children love jigsaws and you can make one easily from our friendly skunk picture. Older children can even cut out the pieces themselves, or help younger children - it's easy when you use our jigsaw instructions and cutting guides. You've probably heard about how skunks spray their enemies with a terrible smell when they're scared! But most of the time they're a shy animal that doesn't want to fight. Here's a poster of a cute skunk to print out and put up on a wall or in a classroom. Skunks have a bit of a bad reputation for their ability to spray a horrible smell. Will the kids write about the skunk spraying his smell on this story paper - or perhaps write some research work? Children can practise drawing curved lines by following the dotted line on our skunk tracing page. Colour in the funny skunk and trace the word beneath on our word tracing worksheet for younger children. There's more to skunks than the bad smell they're sometimes known for! Can the kids find out a little more about them and record what they learn on our skunk worksheet? Our colouring cards make an extra special greetings card for friends and family, especially if the kids do their best colouring! This one features a woodland scene with two adorable skunks. Here's a fun poster of two skunks, ready to print and use in animal-themed displays. Use our pretty story paper to write about the lovely skunks or to make up a story about them. Don't forget to colour in the picture! Available as lined and handwriting lined versions.